Trachyspermum roxburghianum (also known as Carum roxburghianum) is a flowering plant in the family Apiaceae. It is grown extensively in the South Asia, Southeast Asia, and Indonesia. Its aromatic dried fruits, like its close relative ajwain, are often used in Bengali cuisine but are rarely used in the rest of India. The fresh leaves are used as an herb in Thailand and it is used medicinally in Myanmar. It is a very strong spice, with a characteristic smell similar to parsley and a taste similar to celery. A couple of pinches can easily overpower a curry. In Bengali cuisine the seeds are used whole, quickly fried in very hot oil until they crackle. 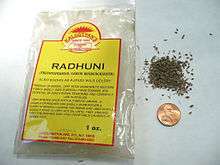 They are part of a local panch phoron (Bengali five spice) mixture, the other ingredients are cumin seed, fenugreek seed, fennel seed, and kalonji. In other places, a common use is in pickles or spice mixtures. ↑ Geeta, R. "Radhuni: what is it??". Retrieved 2008-04-19.